There are many reasons for taking up running as a sport. For some the simple action of getting out there is sufficient, but for many it’s about testing their ability to see either, how far they can go, or how fast they can cover a particular distance. In all cases it’s useful, arguably even essential, to be able to monitor your progression and to know that you are getting the most from the time you invest in training. For the most social or health-focused runner training is an end in itself: the mental relaxation and rejuvenation of body and mind becomes their own reward. Thankfully there is a direct correlation between performances at a shorter distance and your potential to perform at a longer distance, which makes the massive increase in weekly park runs a huge benefit to runners of all abilities. Most runners will complete a 5 km between 13 and 40 minutes and can then use this as both a measure of their current performance level and to predict their times over 15k, 21k, 42k Two Oceans, Comrades and even 100km. Quite simply: the faster you are over 5km the faster you will be at 10k, half marathon, marathon, two oceans, comrades and 100km. In reality the same predictive quality exists with your time over 1500m or a mile (1609m), and these are very convenient distances which are minimally impacted by weather or other external conditions. This means that they can be repeated at regular intervals to measure progression or in the final two weeks prior to a race to predict the runners time at a longer distance. This latter ability is absolutely vital, and the first step, in the preparation of a race pace strategy. This relationship of distance time and performance level, allows you to determine the key physiological training paces for your current level. In many cases it is not that runners aren’t spending enough time training, but rather that they are not training at the correct paces – be that in long running, or in intervals, repeats, or tempo running – to gain the best benefit of that training time. In short they need to train smarter, not longer. Training, monitoring, and racing over short distances, also improves style and hence efficiency, irrespective of age or experience. By keeping a database of these short distance ‘test times’ and the personal best at each distance it is also possible to gain insight into your balance of quality and endurance in training, or flaws in racing strategies. Clearly then a flat out effort over 4 laps of a standard 400m track, (1600m), can provide a wealth of feedback information. 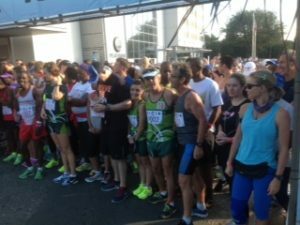 It is exceptionally encouraging to see the growth and resurgence of street miles such as those held in Tembisa, Randburg and the recently announced Sun Mile around a course in central Sandton. Anyone who has been in the armed forces will probably remember the standard Defence Force 2.4km run test, which was used as a measure of fitness and became a regular ‘feature’ of basic training. Over the years thousands of conscripts developed a ‘love hate’ relationship with the 2.4km distance, which often had a 12 minute pass/ fail limit. A study by S Burger in 1990 concluded that this had a linear relationship between the time taken and the VO2 levels measured in a lab using a treadmill. Typically, these tests were completed in platoons, or squads, whereas in my opinion the distance, and the 5km is too long for a runner to complete on his own. While group running, or a normal race or park run can provide a competitive environment to maintain mental focus, maintaining a racing mentality and physical intensity over these distances as a sole individual becomes a greater challenge. For this reason, I favour the 1.6km distance as a basis for performance evaluation. I consider this a ‘drop of a hat’ test in as much that you need only have a couple of easy days training prior to the test, and one easy day after the test to ensure recovery. FACT: Its is your Speed and Power that determine your Potential – turning potential into reality in longer distances comes from Endurance which is the easiest to develop at any time of year. There is no level of experience, no age, and no circumstances where this should not be true. You may not be first across the line – you may not be last – but a park run every 4-6 weeks will let you know if your training is on track for that next Marathon or Ultra Goal.